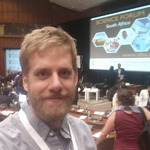 I am a PhD Student at the University of Pretoria and an Affiliate Research Student at Stellenbosch University. I am part of an incredible team of researchers at FABI that turned my dream into a reality when we launched Cape Citizen Science. So far, we have engaged more than 120 individuals in our research, we have developed an effective youth engagement activity, we have collected hundreds of Phytophthora isolates, and we have sequenced genes to identify species. Now, we are ready to collect more samples, test more hypotheses, discover more species, and engage more citizens! The Smiles We've Inspired—Thanks to you! South Africa update: travels, disease in the fynbos, a website and our first outreach activity! Ready.. Set.. Adventure! Here I come South Africa! Awesome project Sean! Get these communities documented before the EAB arrives in Oregon! Hi Jim, thanks again for your help and support! I am shooting for moving in late July. I hope to see you again before then. Hi Andrea! Thanks! Now that you are a backer, you will see how the project unfolds. Engaging South Africans is certainly going to be a challenge, but I have a few ideas that I will try to articulate in a lab-note soon (you will be notified). Definitely open to other ideas though. Lets keep in touch. Thanks! Thanks Mark! Glad to have met you at the market! Thanks for appreciating the project. Hi John and NIcky! Thank you both. Miss you guys, hope to reunite again soon! Hey Lacey! Thanks for your support and for sharing the project on your FB! I look forward to following your updates about your adventures in Oregon! Take care and keep in touch. Hey Andrew! Cool project dude! Finding any truffles when you collect the roots? Have you been part of the conversation to use biotech to engineer resistance to C. parasitica? Pretty interesting stuff. Have fun with your study! Hank and Christine! You guys are the best. Looking forward to staying in touch for the rest of our lives! Hi Terry! Thank you for your support! I think of your family and Kansas often. Hope to reuinte soon! Have fun with this dream project! I look forward to seeing more of your photos. Hi Tracy! Thank you for your generous support! The connection with Alison is honestly one of the best things to come out of this crowdfunding campaign thus far—her adventure is inspiring— and now you have added a cherry to the top! Thank you!